Government is about to implement Direct Tax code. Revised draft of DTC is posted on finance ministry website today. As per new DTC draft exemption limit at Rs 2 lakh is kept as it is and forth slab is introduced for super rich. Draft said tax the super rich heavily. 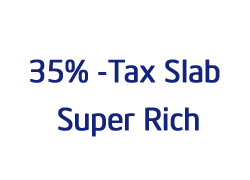 Proposal is new tax slab of 35% for income exceeding Rs 10 crore. In our earlier post we have debated a lot on taxing super rich at higher rate. No tax on income of up to Rs 3 lakh per annum. Bill also propose to lower age limit of senior citizen by 5 year from 65 years to 60 years. Another suggestion given in draft is that foreign companies with more than 20 per cent assets in India will be subjected to domestic tax laws. Recommendation given in draft may not be acceptable as it may lead to huge revenue loss. Total revenue loss worked out to be Rs 60,000 crore approximately. Revised DTC draft was to taken up by the Cabinet in August 2013 but yet it has not come up for discussion because of differences over introducing a fourth slab for the super-rich. DTC decision will be taken by next government may be in mid may after general election and formation of new government till than Super rich has to wait and watch.